This is "Scooby Doo," a 60 lb. robot built by the same people that sell you the Roomba vacuum cleaner. 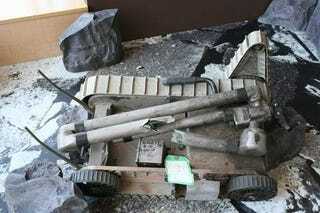 It defused 19 explosive devices in Iraq before being "killed" in action. Last week, I learned how to drive it. Not only did I learn to drive it, I even learned how to get the little droid to pick up my iPhone. Read on. If you want to see this in one nice, long page, click here. Forget the Roomba. iRobot's coolest products are those it builds for the government. The Packbot is the most popular entry, with more than 3,000 units deployed in the field. There are nearly limitless applications for the 'bot, from surveillance to hostage negotiation to bomb disarmament. Pretty much whenever there's something you need to stay the hell away from, the PackBot comes in handy. The PackBot has a number of built-in cameras sending a constant stream of video up to 1000 meters back to a ToughBook-like laptop. The PackBot's operator uses a PS2 controller to control it — it's a lot easier to pick up if you've played Halo before — but the key is to go slow. The left joystick handles forward/back/left/right, and the right joystick directs the main camera. The little guy can move up to 7 mph, but there's a small bit of lag between command and execution, so when you're rolling up on a potential explosive, you want to be careful. Luckily, there is a speed-limit feature that can restrict how fast your ‘bot moves around. The PackBot's arm has three joints that give it extraordinary flexibility for surveillance around corners, or for examining a suspicious vehicle. In this picture, the operator is demonstrating how the robot can look underneath a car for explosives. The "head" is equipped with a number of eye-wateringly bright LEDs that will illuminate whatever dark corner of the world you're exploring. The arm can easily extend around a corner to gather intel, and can even smash car windows to explore the interior without exposing anyone to danger. Sometimes, an Explosive Ordinance Disposal (EOD) technician might want to move a potential explosive from an area where it might put civilians or soldiers in danger, to somewhere else less dangerous. In our case, we moved it from a sandbox to a table. The PackBot isn't particularly difficult to control — it really is like playing a first-person shooter on a console, only there is no reset button if you screw up. Go slow. Explosives tend not to like being bumped or shaken, so, seriously, the slower the better. At the top of the arm is the main camera, but the "gripper" is on the front-most joint. It's able to turn in almost any direction to grasp objects, and can lift up to 30 lbs, depending on arm position. The small grey box at the bottom of the arm has another camera inside that automatically follows the gripper no matter where it moves. By using this camera, the operator can see exactly what the gripper is doing. Just below it (out of view of this shot), is a ground-level camera that shows what's directly in front of the 'bot. If you're navigating uneven ground, this is useful for finding the safest path. This promotional video from iRobot shows how the PackBot can be useful in a more traditional civilian police/SWAT environment. The PackBot platform is very flexible, and payloads can be adjusted to suit individual missions. The ‘bot can be equipped with shotgun-like explosives that can blow open locked doors, laser sights, infrared cameras and Nuclear/Biological/Chemical (NBC) sensor kits. There is also an open API, allowing developers to come up with new payloads as missions dictate. But what about you, the consumer? What would you use the PackBot for? Perhaps to grab a beer from the fridge or to keep those meddling kids off your lawn. Not me. When I was taking the PackBot for a test drive, I "accidentally" dropped my iPhone on the ground. Naturally, I used the PackBot to pick it up. Yes, it would have been much (much) faster to just pick it up, but that would have been considerably less fun. Bear with me while I struggle to pick up the nuances of robot driving (and enjoy the corny music!). Thanks to my wonderful girlfriend Jaime for shooting the video!